What at first appeared to be a comfortable game for St. Henry Friday turned into a battle for the ages… and the underdog Anna Rockets came out with the win. 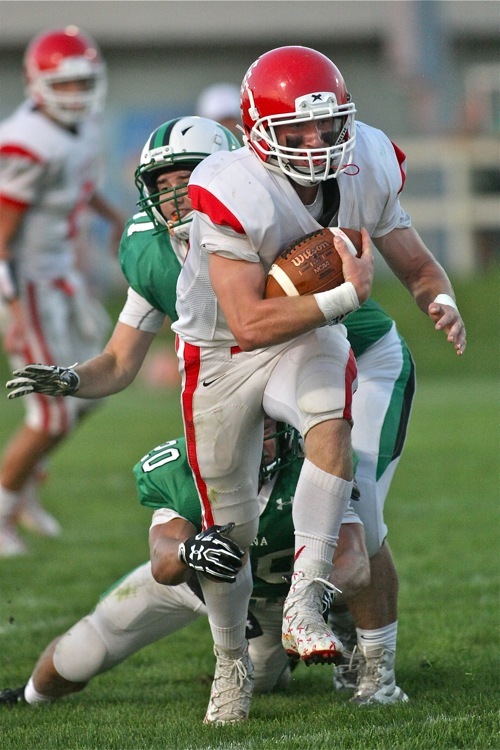 Anna – Star senior running back Zach Niekamp couldn’t be stopped all game for the St. Henry Redskins. He couldn’t be stopped on a fourth-and-one in the second quarter, in fact he went forty-three yards for a touchdown. He couldn’t be stopped on a pair of third-and-eights toward the end of the half, allowing St. Henry to run the clock down and take a 14-0 lead into the locker room. Once Anna came back and tied the game, he couldn’t stopped from going 70 yards around the right side and punching the ball in from one yard out on third-and-goal to put the Redskins up 21-14. And he couldn’t be stopped on six straight carries when St. Henry trailed in overtime 28-21 to put the Redskins on the cusp of victory, down 28-27 with a decision looming on whether to play for a second extra period or the win. So logically, Redskins coach Brad Luthman figured the Anna Rockets couldn’t stop Zach Niekamp on a two-point conversion attempt for all the marbles. The 195-pounder took a hand-off to the left side and met a trio of Anna defenders at the two, who fought and clawed and pulled the senior to the grass at the one. Ball game. There was a lot of fighting and clawing for the Anna Rockets in their 28-27 overtime win against St. Henry at home in a Friday night upset. 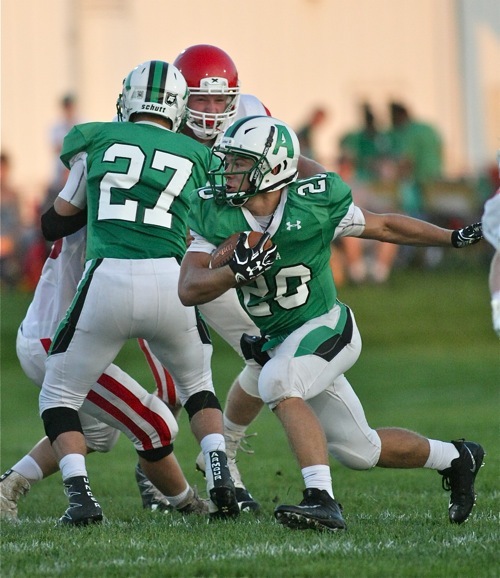 Zach Niekamp powers through a tackle for part of his 244 yards rushing and three touchdowns. Those leaders Marino mentioned, guys like junior running Riley Huelskamp and junior quarterback Bart Bixler, came through in a big way during the second half of this football game – more on that in a minute. This contest opened as a game of missed opportunities. Anna received the opening kick and picked up a couple first downs to move the ball down to the St. Henry 41-yard line. Offensive coordinator Wes Hunsucker rolled out a play-action pass on first down, with Bixler airing one down the right hash. Last week’s star put the ball right on the money for an open Isaac Lininger. The ball bounced off his hands. A sack followed a few plays later and the drive stalled. St. Henry struck quick with a 30-yard pass completion to junior tight end Jackson Heath, moving into a first-and-goal situation within three plays. A sack and an imcompletion or two later, the drive stalled. Junior Ethan Thieman trotted out for a chip-shot 30-yard field goal. He missed it wide. Following a Rockets three-and-out the Redskins drove 35 yards in seven plays, setting up a first-and-goal after a 13-yard run by Niekamp. That run wasn’t complete without two broken tackles, of course. But yet again, the drive appeared to stall. Anna’s second sack of the night was followed by an incompletion and now it was third-and-goal at the thirteen. Senior quarterback Sam Lefeld rolled right, shook off a pass rusher, and broke towards the endzone. A horde of Anna defenders met him at the two-yard-line, but the Redskins’ offensive line piled behind and drove the quarterback past the goal line for the game’s opening score. St. Henry led 7-0 at the end of quarter one. Anna’s Riley Huelskamp had 123 yards and three touchdowns in Friday’s win over St. Henry. 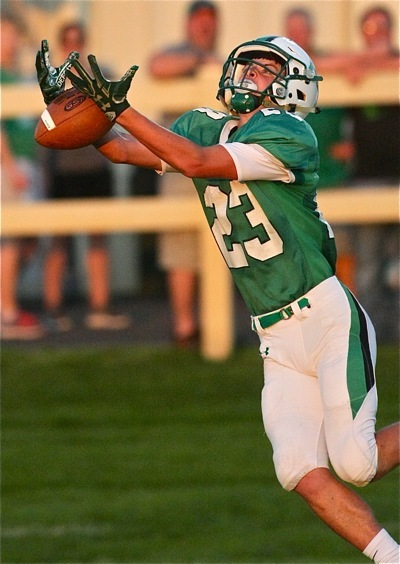 Another Rockets three-and-out was followed by the 43-yard Niekamp touchdown run, slicing right through the heart of Anna’s fourth-and-one defense after bouncing off a linebacker. 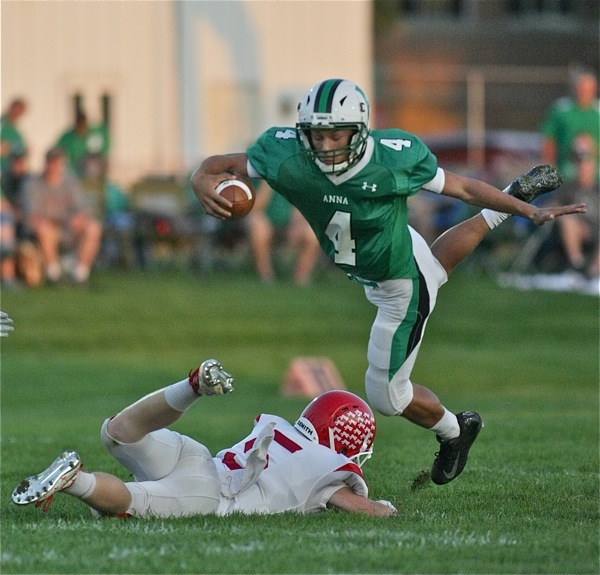 St. Henry almost scored again before halftime after coverting a pair of third-and-eights with Niekamp running from the wildcat, but another Rocket sack and the Redskins let the clock hit 0 to take a 14-0 lead into the half. That’s when the fighting and clawing began. As much is clear when that team’s running back finishes half one with 142 yards en route to a 32-carry, 244-yard, three-touchdown performance. Bixler threw Anna’s first punch. His first play of the second half was a 20-yard strike to junior Justin Murray, and he backed it up with a fifteen-yard throw to junior Jeffrey Richards. St. Henry’s stout defense soon made a stand, though, forcing a fourth-and-four at the 29-yard-line. Bixler dropped to throw but got smacked by a pair of Redskins defenders. Somehow he flung the ball forward while going to the ground. Huelskamp caught it in the backfield and ran five yards for the first down. Bixler polished off the drive with a pair of 11-yard runs and the score stood 14-7. Isaac Lininger has the ball slip through his hands on a first quarter pass attempt. A fumbled snap later and Anna got the ball back at the Redskins’ 25-yard-line. Huelskamp leapt overtop the defense soon after for a two-yard score and tied the game at 14. The team that totaled 39 yards of offense in the first half was now putting crossing the goal line a majority of drives. Whatever halftime adjustments the Rockets made, clearly they were effective. Credit goes to Hunsucker on that one, who also fought to be in Friday’s game. Down again at 21-14, Huelskamp got his opportunity to show why he’s one of those leaders Marino mentioned. Breaking a tackle and picking up 20 yards to open the drive, Hunsucker played for four downs on third-and-eight by giving the ball to Richards on a jet sweep. This set up fourth-and-two. Richards came in jet motion again, but this time ran past Bixler without ball in hand. Instead Huelskamp got it up the middle. He picked up six before getting touched, bounced off that defender, and bolted out another game-tying touchdown, from 40 yards away this time. The score held 21-21 to force overtime. Eight yards away from pay-dirt, Huelskamp got the call once again on the first overtime possession. He got it all in one carry, taking a trio of Redskins defenders along on a ride to the endzone. That set up the final drive in which St. Henry failed to convert for two and lost the game. Huelskamp finished with 24 carries for 123 yards and three scores. Not to be lost in any of this is the defensive performance of junior linebacker Kam Steward, junior defensive back Brandon Shannon and senior lineman Luke Cantrell. Steward and Shannon gathered a ridiculous 13 and 14 tackles respectively, and Shannon forced a fumble that Steward recovered. Cantrell finished with five tackles of his own and added 1.5 sacks. On paper, the Rockets should not have won this game. St. Henry was the bigger, faster, stronger team with a much larger roster, much more talent and much more senior leadership. But sometimes in a collision sport like football, it only matters which team has the most fight. Tonight, Anna fought as hard as humanly possible and earned this win.